Novitatech’s assistive technology service team supports both adults and kids to access equipment and devices to support you in moving, communicating, playing, learning and working. 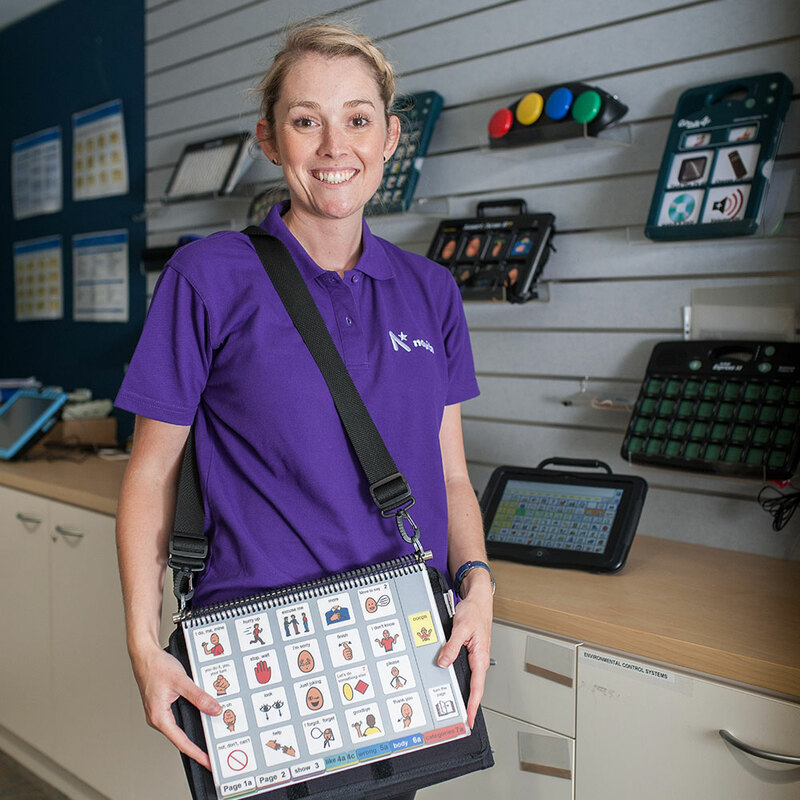 Novitatech is an assistive technology service team of very experienced people, including physiotherapists, occupational therapists, speech pathologists, allied health assistants, rehabilitation engineers, orthotists and technicians, skilled in supporting you with the right assistive technology. We are very skilled in supporting you with assistive technology, which includes anything from a simple device in the kitchen like a tap turner (to make using them easier), to a powered wheelchair or computer that is controlled with your eyes (called eyegaze technology). Our staff have specialised knowledge and skills to support kids, adults, families and carers to select, set-up and access the most appropriate assistive technology to support with mobility, communication, education and daily living. How does Novitatech support me? Clinics where individuals can come along to be assessed and try out a large range of equipment from various suppliers rarely all found together in the same place. These appointments can help therapists and families choose the right piece of equipment and include walkers, powered mobility, shower chairs and modified bikes. Training and support using different types of assistive technology. This can be provided either individually or in a group setting. Training can also be provided to carer, families, school staff and other community groups. Access and Communication Technology Service (ACTS): is a specialist service that provides specialised AT prescription support to therapists working with kids and adults. Seating and Mobility: The Seating and Mobility team specialise in the assessment, design and fabrication of custom solutions for clients with complex AT needs. Orthotics: fabrication of a broad range of orthotic devices made to meet individual needs and maximize support and function. How can I fund assistive technology? Service clubs such as Lions Club, who support the Australian Lions Children’s Mobility Foundation (ALCMF) to fund a diverse range of walkers and other equipment. To find out more about funding sources, visit our 6 Steps to Success or for information or free advice, speak to someone in our friendly team on 1300 NOVITA (1300 668 482) or visit our Contact Us page for more ways to get in touch. Where does Novitatech provide these services? We provide a range of the Novitatech services from all of Novita’s metropolitan sites. Depending on what type of service you wish to access, we can often visit at private homes, preschools and child care centres, schools, hospitals and supported accommodation facilities. In some cases, you may need to travel to Novita’s Regency Park Centre to access certain trial items or for certain assessments and appointments where modifications can be made on site. If you would like information or free advice, or to book into a no-waitlist consultation, speak to someone in our friendly team on 1300 668 482 or visit our Contact Us page for more ways to get in touch. A repair and maintenance service is available with mobile technicians who can provide services wherever the client may be in the community. Some repairs may require equipment to be modified at the workshop in Regency Park, and our experienced technical team will be able to advise what is required and the timeframe this can be completed in. For equipment owned by the DCSI Equipment Program, contact Domiciliary Equipment Service (DES) by calling 1300 130 302 to request Novita to complete a repair. Novita can provide electronic repairs, customisation and technical support for a wide range of assistive technology devices. We have a well-appointed electronics workshop at Novita’s Regency Park site. The service is provided by an experienced electronics technician and supported by Allied Health Assistants.